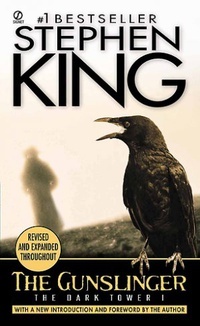 The Gunslinger introduces Roland Deschain of Gilead, of In-World that was, as he pursues his enigmatic antagonist to the mountains that separate the desert from the Western Sea. Roland is a solitary figure, perhaps accursed, who with a strange singlemindedness traverses an exhausted, almost timeless landscape. The people he encounters are left behind, or worse - left dead. At a way station, however, he meets Jake, a boy from a particular time (1977) and a particular place (New York City), and soon the two are joined - khef, ka, and ka-tet. The mountains lie before them.